Man, I’m going to miss this place. Just as I was starting to feel settled and get closer to the people I’ve met here, it’s time for me to leave. That always seems to be the case. I’ve said a lot of hellos and goodbyes throughout the past few years when moving from Massachusetts to Rhode Island to Florida to Texas. I’m looking forward to this next part of the journey, though. I’m going to be reuniting with friends in Florida and starting a new job. It’ll be my first full-time job and the first time I’ll have an apartment that I can truly call my own. When I arrived in Texas, I felt overwhelmed and scared. Everything seemed so sprawling, so unfamiliar. But with time, my familiarity grew, as did my fondness for the city. That’s what’s so great about traveling — you’re faced with the challenge of stepping outside your comfort circle and exploring new territories that you may have never thought you’d like. I’ve often thought that being a journalist is the best way to get to know a place because it forces you to get out and find story ideas, meet people, and build sources. As you explore, you have to learn to embrace the wrong turns and the unreliable directions because, really, it’s in getting lost that we find our way. I’m hoping I can find my way back to St. Petersburg, Fla. 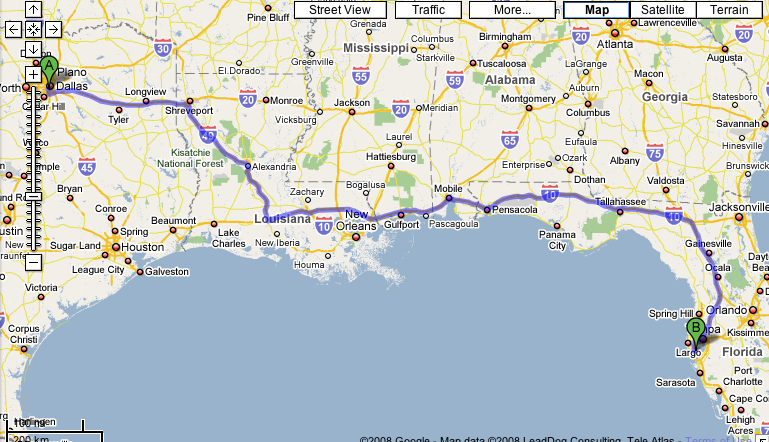 I start my 18-hour road trip Wednesday morning and will be stopping halfway in New Orleans before arriving in Florida on Thursday. My departure is bittersweet. I like to think of it as more of a “so long” than a goodbye. I know I’ll run into some of the people I met in Dallas at some point in the future and that we’ll keep in touch. Already, two of my Dallas friends are coming to St. Petersburg next month — one for a wedding and one for a Poynter seminar. “So longs” are never fun, but they often yield new friends, new beginnings and much-needed reunions. Thanks, Dallas Morning News friends, for a memorable three months. I’ll miss you.